Pakistan sealed a comfortable win over New Zealand in Buderim to make it three victories in a row and set up a quarter-final clash with arch-rivals India. Each of Pakistan's five bowlers picked up at least a wicket each, as New Zealand's decision to bat first backfired. The top-order batsmen got starts but batted slowly and were dismissed after being set. Opener Joe Carter made 21, captain Will Young chipped in with 18, Robert O'Donnell made 29 and Henry Walsh top-scored with 33. But only one stand in the entire innings went past 50. Seamers Zia-ul-Haq and Ehsan Adil bagged two wickets each and Mohammad Nawaz's left-arm spin continued to be effective, fetching him two wickets as well. All New Zealand managed in the end was 152 for 8 in 50 overs. In their response, Pakistan lost their captain Babar Azam early but Imam-ul-Haq made 40, adding 51 with No.5 batsman Saad Ali. 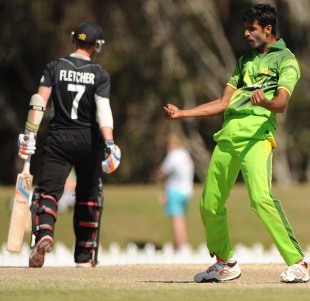 Nawaz made a quick, unbeaten 23 and saw Pakistan through to victory in the 32nd over in the company of Salman Afridi. England secured their passage to the quarter-finals of the Under-19 World Cup by routing Nepal in Townsville on the final day of group matches. The wicketkeeper Ben Foakes made a sprightly 92 to underpin a first innings tally of 274 for 7, before Shozair Ali and Reece Topley shared seven wickets to round up the Nepalese for 148, despite a composed innings of 55 at the top of the order by Subash Khakurel. Batting first after winning the toss, England's innings progressed smoothly enough thanks to Foakes' rapid scoring, all the top eight batsmen passing double figures. Ben Duckett's rapid-fire 55 from 33 balls livened up the closing passage of the innings, and ensured Nepal were chasing a very steep target indeed to register an unlikely first win of the competition. As he had done previously in the tournament, Topley struck in the first over of the innings, swinging a delivery through Sagar Pun's defences and setting the tone for the afternoon. Khakurel's innings took place amid the wreckage, as Nepal were 9 for 4, then 25 for 5 before Hasim Ansari provided nuisance value with his 36. Ali's wickets were gained with a combination of swing, speed and intelligent lines, and it was he who concluded the match by splaying the stumps of Nepal's last man Avinash Karn. Bangladesh confirmed a quarter-final clash with Australia, beating Namibia by seven wickets in Brisbane. The win meant Bangladesh finished the group stage at No. 2 on the Group D points table, behind South Africa but ahead of Sri Lanka. Namibia chose to bat, but could not get much of a partnership going all through their innings. Their batsmen failed to build on starts: while seven of their top eight got into double digits, no one other than captain Stephan Baard got past 20, and even he could only manage 40. The Bangladesh bowlers - left-arm spinner Naeem Islam jnr in particular - maintained very tidy economy rates and shared the wickets around, as Namibia were bowled out for 151 in the 50th over. The chase was anchored by opener Liton Das, who remained not out on 70. Soumya Sarkar, Anamul Haque and Al-Amin played quick cameos around Das, helping Bangladesh ease home with 13 overs to spare. Bangladesh will play their quarterfinal against Australia on Sunday in Townsville.